-- Cut to your specifications! 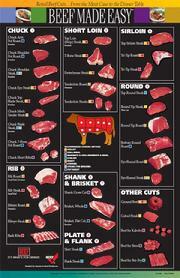 Do you know what part of the animal the different cuts of beef come from? Below is another document, displaying the actual cuts in relation to the above diagram. Click on the below image to enlarge it. It is very informative and helpful when understanding where each cut comes from and also gives tips on different ways to cook different cuts. Be sure to "CLICK" on the picture to make it easier to read!